We build businesses from Scratch every 30 days – The Bizathon Challenge! If you haven’t started with Shopify, you’ll want to by clicking here. This month we’re building a profitable Shopify store from the ground up! Yesterday we revealed What To Look For In A Premium Shopify Theme. 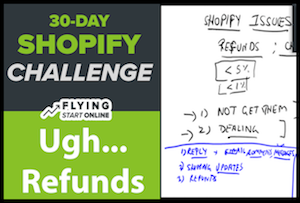 Today we cover how to handle “Shopify Refunds” and chargebacks. It doesn’t matter what you’re selling online, you are going to encounter chargebacks. Don’t view this as a negative. Simply prepare yourself for different likely scenarios in order to retain customers and ensure continuity moving forward. Take the lessons we’re teaching you and apply them across all your businesses, not just your Shopify. Chargebacks and refunds always hurt. They come with the territory of business ownership. But there’s a simple way to significantly reduce their occurrence and avoid them nearly altogether. Answer every single support email, phone call and comment. If somebody makes a purchase and then can’t get ahold of you for whatever reason, they are very likely to cancel the purchase. Another very simple way to avoid refunds and chargebacks is to be forthright about pricing and shipping times. If you know it takes 3 weeks for a product to arrive, make sure you make it very clear to you customer. If you suggest another time frame or fail to mention it completely, you’re guaranteed an annoyed customer which increases your chance of losing the sale. The quickest way to annoy a customer and potentially lose a sale is by failing to provide tracking numbers for physical shipments. Shopify will automatically email your customers shipping updates. From within your Shopify dashboard, click “orders” on the left sidebar. In the Tracking information section, enter your shipment’s Tracking number. Shopify should recognize the tracking format and automatically choose the shipping carrier for you. If it doesn’t select the correct shipping carrier from the Shipping carrier drop-down menu. You’ll want to cover your bases for potential refund requests or chargebacks from customer credit card companies by clearly stating your shipping and refund policies. 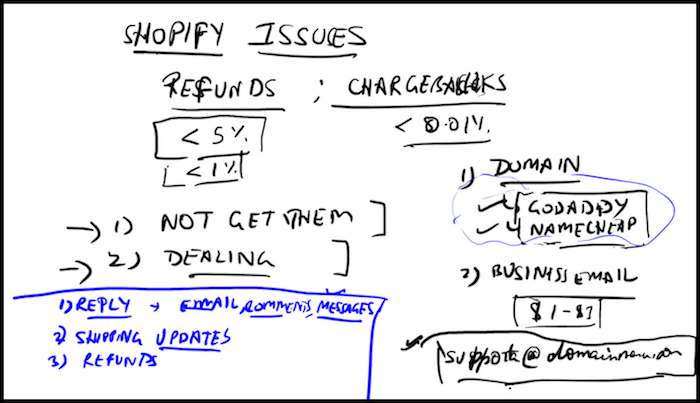 You can copy the shipping and refund policies from Common Panda and just update the wording to reflect your own Shopify store. Click here to view our Refund Policy and click here to view our Shipping Policy. When you use a domain registrar like GoDaddy or NameCheap, you will be able to create a support@yourdomain.com support email. Once you do that you can use an email client such as PrivateEmail or ThunderBird to direct all customer emails to one location. This makes it much easier to track requests and interact with users in a timely manner. If you haven’t already, login to your Shopify Dashboard, click “General” and update all of your Store email fields with your support email address. ChatFuel is a chatbot you install on your Facebook page to strengthen the connection with your audience. You set replies based on keywords and phrases and and chatfuel immediately responders to people on your behalf. This increases engagement and conveys to customers that you are responsive and actually care. That’s it for Day 27 – Well done! P.P.S. Click here for Day 28!